Husband and wife team Salvatore and Amie will welcome you as friends to their charming little gem of a neighbourhood restaurant. 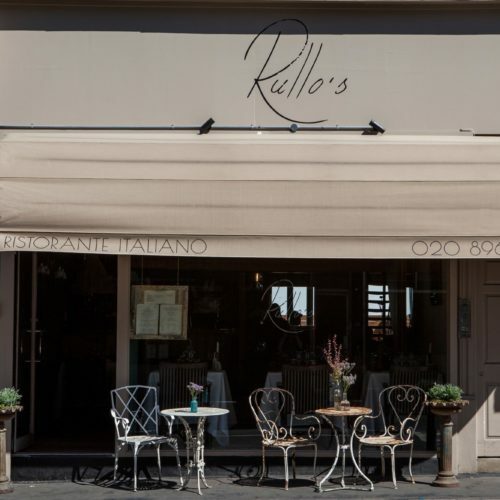 Rullo’s is an upscale yet rustic and intimate Italian restaurant in the heart of Queens Park – the kind of place that feels as though it’s been there forever but is in fact a relative newcomer. This means that the approach to food and drink is fresh and modern – using the finest Italian produce to create traditional fare with a modern twist. Expect gorgeous authentic ingredients such as the creamiest burrata and the freshest tuna. There are always fish, meat and veggie options to suit all and tempting desserts. Rullo’s is passionate about wines and has a wonderful, concise but crisp list including some very special offerings from established Italian wine producer Ocone. Our favourite is ‘Diana’ – a rich and flavoursome Falanghina. Rullo’s offers inventive celebration menus for Valentine’s Day, Mother’s Day and New Year’s Eve as well as popular Sunday roasts. There is also an outside space. Best to book.